This isn't a real post. I'm going to post the real post tomorrow. But it feels like there should be some sort of intermediate thing to prepare everyone for the abrupt change of speed ahead. Here's a picture of an airplane. 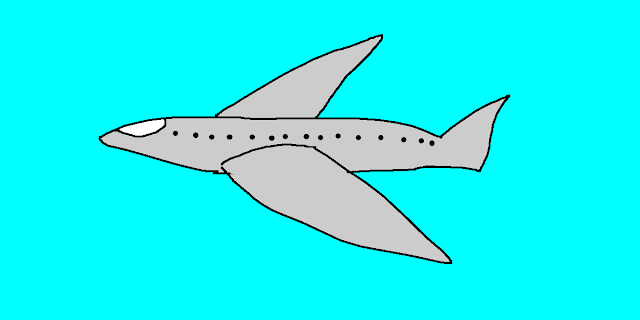 I realize that airplanes don't look like that, but this has been a hard year for me and learning how to draw planes accurately wasn't exactly a priority. I maybe could have chosen to draw something else, but I started drawing the plane, and there was already too much momentum. Anyway, I feel like this is becoming way more about planes than I had anticipated. Let's move on. If, at any point over the last eighteen months, you've wondered what was happening to me and why it might be happening, my post tomorrow should explain everything. I've been working on it for the better part of a year (partly because I wanted to get it exactly right, and partly because I was still experiencing it while attempting to explain it, which made things weird), and I'm relieved and excited and scared to finally be able to post it. At this point, you're all probably wondering what is it? What's in the post?? Is it airplanes? And no, it unfortunately has very little to do with airplanes. * It's a sort of sequel to my post about depression. It is also about depression. In parts, it might get a little flinch-y and uncomfortable, and if I succeed in making you laugh during those parts, you're going to feel real weird about yourselves. But it's okay. Just let it happen. I WANT it to happen. Because it makes me feel powerful, and also because there are flinch-y, uncomfortable things everywhere. Seeing them is inevitable. If we can laugh about some of them, maybe they'll be less scary to look at. Okay, so that's what's going to happen tomorrow. Hopefully this transition post makes the experience less jarring for everyone. *As it turns out, there is a plane. I had forgotten about it (it's small and not the main focus of the post) and the coincidence was entirely unintentional. I'd never tell you there aren't going to be planes while being fully aware that there's a plane.